Fertile, well drained soil amended with compost. Full sun and warm conditions. Not required, but thrifty growth often indicates nutritional stress. Melon, Cucumber, Pepper and Eggplant. Soak seeds in water overnight before planting them 1 inch deep and 6 inches apart in warm soil. Thin to proper spacing after two weeks. Requires warm weather to grow well. Use pruning shears to gather pods less than 5 inches long. Wear gloves and a long-sleeved shirt to avoid prickles. 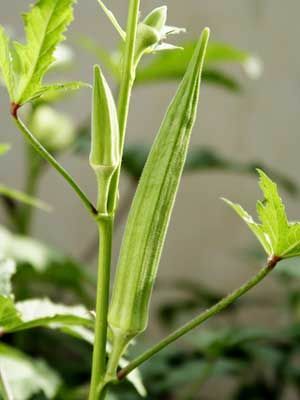 Ants sometimes damage okra blossoms.